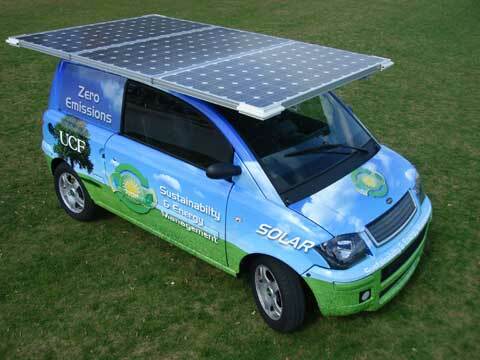 The University of Central Florida has a car completely powered by the sun! The Department of Sustainability and Energy Management welcomes its second eco-friendly vehicle to its fleet. The Zenn car purchased by the department, which offers zero emissions and runs 100% on electrical charge, has been retrofitted to now run on solar power alone. On January 6, 2009, three panels were installed to the roof of the vehicle. Two of the three panels, connected in a series, are used to power a 48V charge controller. The remaining panel powers a 24V charge controller. Together the two produce the needed 72V for the vehicle. "In six weeks, we haven't plugged it in at all," said David Norvel, the director of Sustainability & Energy Management, as he drove the car he was responsible for discovering. "We're trying to keep from doing that. We're trying to keep it so we can say that it was never plugged in since we plugged the solar on. That's our goal." Eugene Roberts, the senior engineer, said. "It's comfortable. It's air-conditioned. It has a really nice radio. It shields from the weather. It has windshield wipers..."
The average usage of the vehicle is 15 miles per day. The rooftop solar panels have successfully maintained the vehicle charge to date! This means, no fuel, no plugging in, and no emissions. This on-campus fleet vehicle is completely carbon neutral by utilizing the sun's rays. The University of Central Florida is incredible. They have created a self powered electric car, that works, with A/C! This car encourages me more than any other. It works, it has doors and windows, and a windshield with wipers, and it uses no fuel and has a pretty good range. For using zero fuel, it has an incredible range, averaging 15 miles per day, in the winter. In February 2009, the is the most practical self powered car on the planet. I'm looking forward to see what 2010 will bring.